Are you responsible for marketing to senior citizens in Southeast Texas? Then you are in luck. SETXSeniors.com and the SETX Seniors Resource Guide have been so successful in providing content to seniors and marketing to the senior services sector in Southeast Texas that their model is being adopted in major markets like Houston and Savannah. The good news is you can put these great resources to work for your company – at budget friendly Southeast Texas marketing rates. The site publishes 400+ LOCAL articles each year for their core audience – seniors 55+ living in Jefferson County, Hardin County, Orange County, and Tyler County Tx. Essentially, the site is an online magazine for Southeast Texas Senior citizens. Best SEO in Southeast Texas. Have you been struggling with Search Engine Optimization? SETX Seniors can help. The local content makes their advertisers very visible on Google and the other search engines. Try Google searches for terms like: wheelchair delivery Southeast Texas, senior car buyer Beaumont Tx, Medicare Advantage Plan help Southeast Texas, and you’ll see their clients multiple times in the top 5 and top 10. If you’ve been asked to boost your position in internet searches, you’ll definitely want to reach out to SETX Seniors. No one does more to make your company, organizztion, or event visible to local senior citizens. Southeast Texas Social Media Campaigns. Daily, the site posts on Facebook, Instagram, and Twitter to their followers. Many local senior service businesses simply don’t have the time to effectively manage their social media – SETX Seniors can be a big help. Even if you are pretty good at keeping up with your social media, their campaigns can be a great reinforcement tool for your social media marketing. Ads start at just $395 per month all inclusive – banner ad, custom articles, Southeast Texas SEO, and social media. Your online campaign is also bundled with a print campaign through the SETX Senior Resource Guide Magazine. . This is a great value for companies looking to advertise to Southeast Texas senior citizens and their families. This is the dominant senior print magazine in Southeast Texas. It is the only senior print media with local content for Southeast Texas. 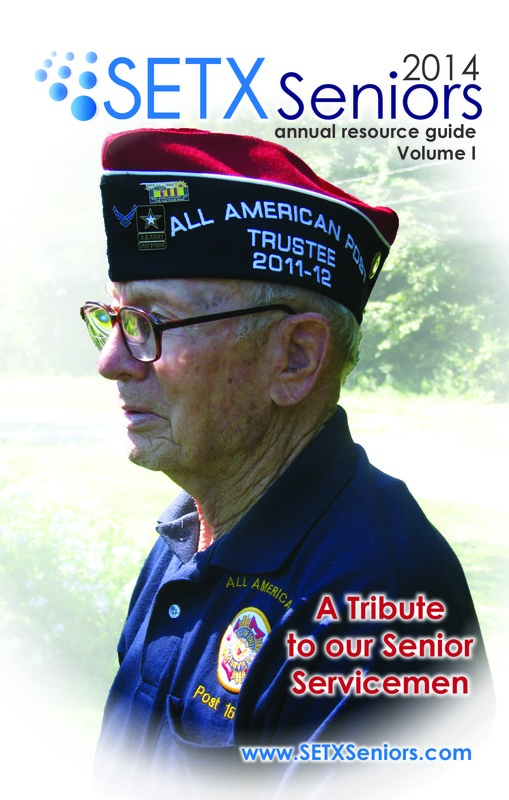 The SETX Senior Resource Guide features local veterans in every issue. Their current series “Last of the Greatest” profiles Golden Triangle World War II Veterans. Do you have a Southeast Texas World War II veteran you’d like to see receive an article? Call anytime. (512) 567-8068. Southeast Texas senior advertisers like the way the SETX Seniors Resource Guide puts their message physically into the hands of seniors. Advertising in the Southeast Texas Resource Guide starts at just $395 per month and includes design of your ad – and your online campaign on SETXSeniors.com. Are you in charge of advertising to Southeast Texas Seniors? SETX Seniors provides two great options – perfectly targeted advertising that is friendly for any budget. The team also coordinates the Southeast Texas Senior Expo Series. The Southeast Texas Senior Expo Series brings live events to the senior community across The Golden Triangle. Would you like information about becoming a vendor at the next Southeast Texas Senior Expo? Click here for the SETX Senior Expo Registration Form. A comprehensive host of organizations that provide valuable resources to Golden Triangle senior citizens: nutrition assistance, home health, hospice, non-medical home care, caption telephone systems, rehabilitation hospitals, clubs for senior citizens, senior friendly exercise facilities, Southeast Texas Medicare Advantage Plans, Golden Triangle senior citizen centers, and many more. Daryl Fant, Publisher. SETXSeniors.com & Southeast Texas Senior Resource Guide Magazine. Click here for more information about advertising through SETX Seniors. Are you looking for more ways to effectively advertise to your target audience in Southeast Texas? Stay tuned to SETX Advertising. You can also “like” SETX Advertising on Facebook to receive the latest Southeast Texas advertising news, insight, and advice right on your cell phone or iPad. The best Search Engine Optimization platform in Texas!